With politicians, users, and even its own employees furious with Facebook in the wake of the Cambridge Analytica scandal, it’s hard to imagine that a company could be more screwed than the social network. But we live in Trump world now, and his “obsession” with punishing Amazon is causing investors to flee at a cost of $53 billion. Amazon’s stock lost $53 billion yesterday as Wall Street becomes skittish over any signs of speed bumps in the tech sector. Facebook has been on a sustained losing streak for almost two weeks and has watched as close to $100 billion was wiped from its market cap. Wednesday was pretty much a wash for the social media company, however, as Amazon became the regulatory target of the day. According to the original Axios report, one source close to Trump said, “It’s been explained to him in multiple meetings that his perception is inaccurate and that the post office actually makes a ton of money from Amazon.” But Trump’s tweet is a rare instance in which there is some truth to what he’s saying. The debate over whether Amazon is screwing the post office is complicated and there’s long been an argument it actually saved the USPS by increasing the number of packages shipped. The introduction of email wiped out 40 percent of the post office’s business on first-class mail since 2000. The increase in package deliveries brought more business to the Postal Service and it even added Sunday delivery for Amazon packages to keep up with demand. But analysts have argued that Amazon is getting a sweetheart deal and the government is essentially subsidizing its shipping. A Citigroup report concluded that the price of shipping at USPS would have to go up an average of $1.41 per package in 2018 to truly cover the cost of delivery. But the postal service has a long list of other issues that contribute to its financial problems. And Amazon is looking to use its enormous capital to start its own delivery service, so we’ll likely see how the USPS does without it in the near future. As for Amazon’s tax bill, it’s true that it effectively paid no taxes in 2017, but it did pay hundreds of millions in taxes over the course of the previous three years. Its SEC filings credited stock-based deductions and Trump’s tax cut plan that includes a loophole for some companies to postpone their tax liability until next year when rates will be more favorable. Trump is also right about Amazon (along with the internet at large) putting brick-and-mortar retailers out of business, obviously. What makes this a conundrum is that Jeff Bezos also owns the Washington Post, which regularly publishes inside scoops exposing the worst of what’s going on in the White House. The president is often critical of the “failing” newspaper. So, even when Trump has a point, it’s impossible to take him seriously because there’s at least the appearance that he has a corrupt motive. Just after Trump’s tweet this morning, Amazon’s stock started sliding further, but it’s begun picking back up in the last hour. 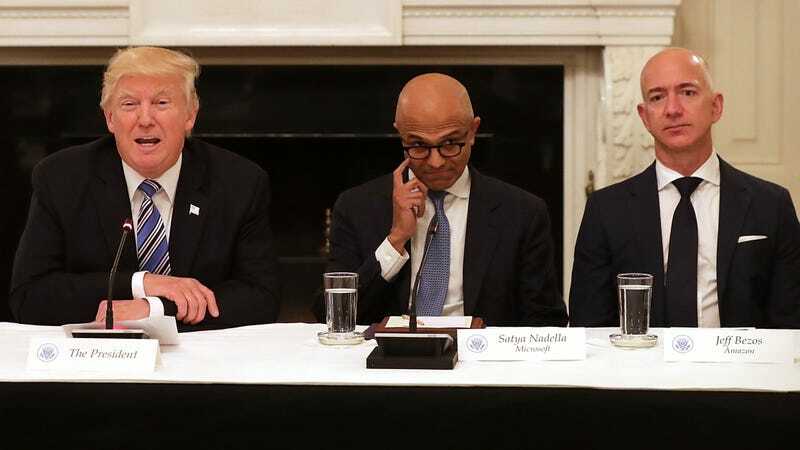 Trump’s favorite lender, Deutsche Bank, quickly urged investors to take advantage of Amazon’s discounted stock and ignore the president. Considering that there’s little rhyme or reason to what he does and that his priorities change on a whim, that’s probably sound advice.